The Home Guard in the Thorpe Thewles Area (1939-45). Can anyone offer me any information about the activities and escapades of the local Home Guard who were station in and around Thorpe Thewles during World War II (1939-45). I know there were guardsmen station in the village and that their local Head Quarters was located in the neighbouring village of Carlton. I would be also keen to know more about the Ack-Ack batteries that were located along the northern perimeter of the Stockton area. Several 3.7 inch Ack-Ack shell heads have recently been found in fields south of Thorpe Thewles. I know there was a famous gun, known as “Big Bertha” or “Kiora” which was located in adjacent to Kiora Hall, close to where Bakeston School now stands. I have been told that this gun fired 3.5 inch rounds and had a very load and distinctive roar when fired. Any information would be most welcomed no matter how small. 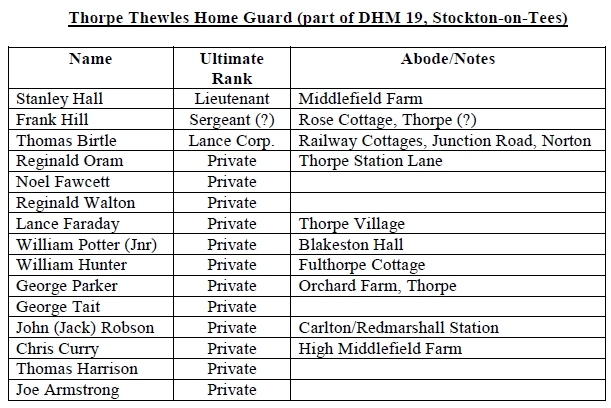 The following individuals have been identified by the TTHG Wartime Memories Project as being members of the Thorpe Thewles Home Guard (1940-44). If you can throw any light on the history of any of these people or add to the above list of names please contact us.